Another great volunteer led impact of Voice of SAP where Bank of Baroda issued communication to their branches to take guidance for upgrading for accessibility with Ashish Deliwala, accessibility expert and Ahmedabad Chapter leader of Voice of SAP. Shri Ashish Madhu, VoSAP volunteer of Ahmedabad, organized meeting between VoSAP Founder Shri Pranav Desai and Zonal head of Bank of Baroda – Shri Sharmasaheb, who in turn was inspired to initiate for upgrading BoB ATMs, branches for accessibility provisions. 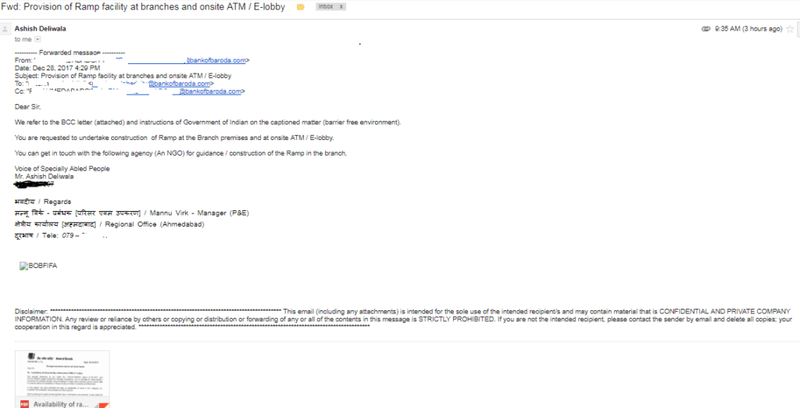 This finally was put to action by Shri Mannu Virk per his email to the branches, in line with directive from Govt. of India on Barrier Free Environment at Banks and start working on this, take help, guidance from Voice of SAP in this matter. Here is the BoB email (after removing contact details).